Austin has a hunger problem. Over 100,000 children in our town are hungry. So are their parents. People in our city choose every day between putting gas in their car so they can get to work…or buying groceries… or buying medicine. When kids are hungry, school is that much harder. They struggle to focus. They lash out in anger. They fall behind. Hungry Souls is doing something about all of this. We deliver nutritious ingredients and easy-to-follow recipes to Austin school children so that when they are away from school, they still have access to good food. We feed their whole family. Through a generous donor, we even provide each family with a crockpot to further help them. We have a waiting list of children who need our help but guess what we need? We need Austin’s help. Our city’s hunger problem is all our problem and working together we can make a difference. 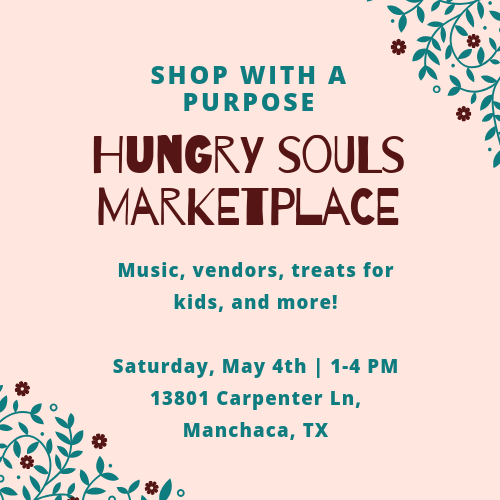 Please join us on Saturday, May 4 from 1 to 4 p.m. at Merryvale, 13801 Carpenter Lane in Manchaca, just off Bliss Spillar Road. The venue is lovely, a secluded, special acreage close enough to town to make it convenient but far enough away to feel like a country outing. Under a canopy of gorgeous shade trees, our festivities will raise funds for more food and also help us reach out to the Austin community with information on both needs and volunteer opportunities. Let your kids play or get their faces painted. Put them to work at the Hungry Souls table creating masterpieces to be included in food delivery bags. Imagine the joy hungry Austin kids will have when they find an uplifting note written from a fellow child. Devour baked goods. Slurp on a sno-cone. Listen to live music and shop local vendors. A portion of all sales go to support Hungry Souls. ​Make time in your weekend to do something for others while also enjoying this glorious spring and your family’s company. Mark Mothers and Fathers Day, graduation and baby shower gifts right off your list by supporting our vendors who are supporting Hungry Souls. Help us bless hungry families right here in our town. This beautiful city should not have hungry children. It’s a problem we can face and defeat. Come on May 4 to learn more, have fun and take a stand against hunger. Have questions about our event or how you can help? Contact us for more information! Don’t forget to RSVP to our event on Facebook! Healthy nutrition is important for the growth of every child’s physical and mental development. But when this necessity is not accessible, it can negatively affect the way they perform throughout their lives, especially in school. This is the unfortunate case for many kids in America, especially in the Austin area where an estimated one in five children are uncertain of when they will get their next meal. It’s a known fact that children need energy to do well in school by eating three well-balanced meals every day. Without this, they tend to have lower scores on their tests than their food-secure peers. A lack of food can also hinder the rate at which they learn reading and mathematical skills. It also affects their ability to focus and advances behavioral issues. As childhood hunger is often stigmatized in the media, this can cause a lack of self-esteem in a child’s development. This leads to a number of social and behavioral issues such as depression and anxiety. These students may feel left out among their peers or singled-out in their classrooms. Ultimately, being hungry in school harms how a child views themselves. Being deprived of food can make children more susceptible to sickness and diseases that may be present in their schools. Not having a strong immune system is a huge contributor to toxic stress, which can be a detrimental factor in how a child’s brain functions. By allowing them the resources needed to maintain a more healthy lifestyle, children will grow to be strong, successful members of our community. Overall, food insecurity in children is a fixable issue. Hungry Souls provides an opportunity for food insecure children in the greater Austin area to have the nutrition necessary to succeed, thrive and break the cycle of poverty. 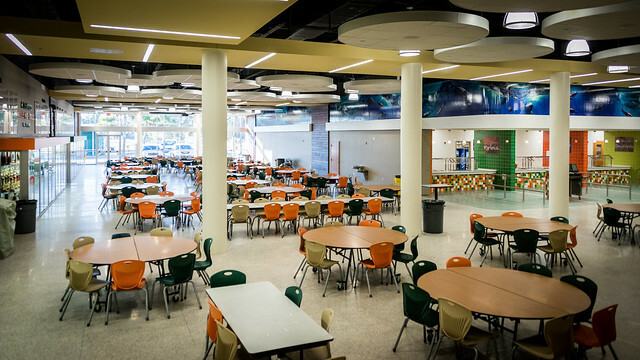 We envision an Austin where all children are well fed and have enhanced educational opportunities. If you want to see more kids in the greater Austin area who thrive in school and are well-fed, ask Hungry Souls how you can get involved! What is food insecurity, anyway? the state of being without reliable access to a sufficient quantity of affordable, nutritious food. Food insecurity is just what it sounds like—it’s living without guaranteed meals each day, and it affects 1 in 5 kids in the greater Austin area. That means that every day in our neighborhoods, there are over 100,000 children who don’t know where their next meal will come from. Hunger has a direct effect on a child’s educational performance and experience. This results in an inability to concentrate, behavioral problems, poor performance in school and a higher dropout rate. At Hungry Souls, our mission is to provide an opportunity for food insecure children in the greater Austin area to have the nutrition necessary to succeed, thrive, and break the cycle of poverty. Hungry Souls partners with local schools to provide weekend and school break meals for students and their families. As we become involved with families through our feeding program we have the opportunity to learn about other needs the families may have. Reaching out and serving them with the love of Jesus is our ultimate goal. Will you join us in our fight to combat food insecurity in our communities? Donate here or contact us for more information. 2/17/19: Random Acts of Kindness Day! At Hungry Souls, we believe in kindness. It’s ingrained in our culture and our daily lives. Kindness is the quality of being friendly, generous, and considerate. We aim to fulfill these words in everything we do. Sunday, February 17, is Random Acts of Kindness Day! Thanks to our donors and volunteers, Hungry Souls started off 2019 strong! Keep reading for a recap on the happenings this month and how you can help us next month. As always, continue to pray that the families in our program experience the love of Jesus every day. Our ultimate goal is to show them God’s love and providence over their lives. Hungry Souls is looking to bring a Volunteer Coordinator to our team! Are you interested in volunteering your time to help organize our team of helpers? Contact (512) 524-9067. Lastly, Hungry Souls is growing the number of families in our feeding program, and because of that, we NEED to purchase a van to use for food deliveries. Are you interested in contributing towards a Hungry Souls delivery van? Contact us for more information on corporate sponsorship or donate online. Thanks to the following organizations for raising so many food donations! Are you interested in hosting a food drive? It’s easy! Contact us for more information. In December, we had a group of volunteers fill stockings with small gifts for the children in our feeding programs. In total, we filled 48 stockings—that’s $2,400 worth of gifts for needy kids in the Austin area! Interested in sponsoring a local family in need? All it takes is $38 for us to feed a family monthly. Your monthly donation will go directly towards fresh, nutritious meals for a local family in need. Click the link for more info! Want to be on our mailing list? Send us your email address! Thanks for reading our blog post.